The Arie Crown Theater is located in Lakeside Center at McCormick Place, just 2.5 miles south of downtown Chicago. Lot C is the closest and easiest parking lot for theater access. Theater parking fee is $23.00. 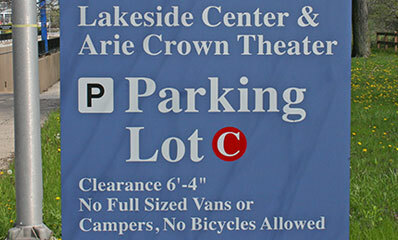 Arie Crown Theater patrons may also avoid the lines for parking by paying for and reserving a Guaranteed parking space in advance. The fee for guaranteed reserved parking is $36.00 per space. For more information, and to order Guaranteed Reserved Parking space click the link below: clickcandpark.com. McCormick Place/Arie Crown Theater offers convenient underground parking for all performances. There is an $23.00 parking fee. The garage is accessible for entrance up to a half-hour after the scheduled performance begins.